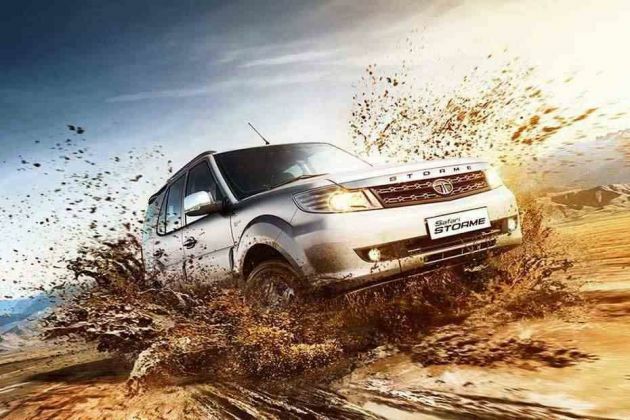 The facelifted version of Tata Safari Storme LX has been launched with a few updates to its exteriors and interiors. This updated version gets a refreshing front fascia with a refurbished radiator grille and bumper along with 'Storme' lettering on the hood. It is fitted with the same diesel engine, but there is a slight change in its power and fuel economy. The exterior dimensions of this SUV remains the same with a large wheelbase of 2650mm along with a decent ground clearance of 200mm. Its overall length, width and height are 4655mm, 1965mm and 1922mm respectively. With a bunch of updates to its exteriors and features, it is going to give a tough competition to other vehicle in this segment including Nissan Terrano, Renault Duster, Mahindra Scorpio and many other vehicles in this class. The company has given it an efficient braking and suspension mechanism, which keeps it well balanced and stable. On the other hand, the car maker is selling this sedan with a standard warranty of up to 3 years or 100000 Kilometers, which can be extended further upto 1 year or 50000 kilometers (whichever is earlier). To begin with, it has a lustrous bodyline and is fitted with a number of striking features. The front fascia gets a lot of changes and now looks more refreshing. One of its highlights is the new radiator grille along with model lettering on the hood. This grille is embedded with a prominent company logo in the center, which gives the frontage a distinct look. It is flanked by a newly designed headlight cluster, which is incorporated with powerful projector headlamps with PES ring and side turn indicator. Just below this, it has a tweaked bumper that houses an enlarged air dam for cooling the engine. Coming to the side profile, it has body colored door handles and outside rear view mirrors. The flared up wheel arches have been fitted with a stylish 16-inch wheels that enhances its sporty look. These rims are further covered with high performance tubeless radial tyres of size 235/70 R16 that offers a superior grip on any road conditions. The rear profile of this sedan is decorated with a radiant tail light cluster, which is assembled with halogen based lights. It also has a smooth surfaced bumper and a very stylish tail gate, which is embossed with variant badging. The bumper is also accompanied by a cladding for preventing the vehicle from minor damages and chrome finished exhaust pipes. The company has designed the interiors of this entry level trim with a java black finish. In terms of seating, the cabin is incorporated with ergonomically designed seats, which offers enough leg space along with head room for all occupants. These seats are covered with high quality upholstery, which gives it a plush appeal, while traveling. The rear seat comes with a split foldable function, which helps it in increasing the boot volume of car. The smooth dashboard is fitted with quite a few equipments like an AC unit, advanced instrument panel and a three spoke steering wheel with company's insignia. The company equipped some of the important utility features including a large glove box compartment, cup and bottle holders, along with 12V power outlets for charging electronic devices. The tilt adjustable steering wheel makes handling quite comfortable even in heavy traffic conditions. This variant has also front roof lamp that can be used as a spot reading lamp and it comes with advanced delay function. Under the bonnet, this variant is equipped with a 2.2-litre VARICOR diesel engine with a displacement capacity of 2179cc. It is integrated with sixteen valves and four cylinders using double overhead camshaft based valve configuration. With the help of a variable turbine technology based turbocharger it can produce 148bhp of power output at 4000rpm in combination with a peak torque output of 320Nm in the range of 1700 to 2700rpm. This commanding diesel engine has been skillfully mated with a five speed manual transmission gear box, which distributes the torque output to its front wheels. It enables the mill to cross the speed barrier of 100 Kmph in close to 12-15 seconds from a standstill. At the same time it can attain a top speed in the range of 190-195 Kmph. On the other hand, it is incorporated with a common rail based direct injection fuel supply system, which allows the vehicle to deliver a decent fuel economy. Its front axle is assembled with a double wish bone type of mechanism along with a coil spring over shock absorbers and rear one gets a 5-link suspension with coil springs, which assists to keep this massive SUV well balanced and stable. Its front wheels are fitted with a set of ventilated discs, while rear ones are equipped with a conventional set of disc brakes. It also has a rack and pinion based hydraulic power steering system, which is quite responsive. This tilt adjustable steering wheel supports a minimum turning radius of 10.8 meters. The roomy internal cabin of this SUV is bestowed with a number of refined aspects, which gives the occupants an enjoyable driving experience. The air conditioning unit comes with a heater and rear AC vents for cooling the engine quickly. It has all four power windows with driver's side up, down and safety function. The company has also incorporated the internal cabin cup and bottle holders in front console, front seat back pockets, sun glass holder, analog clock on center console, front seats with lumbar support, an ashtray and cigarette lighter in front console. This base variant is incorporated with all essential features, which will take care of its passengers as well as the vehicle. The long list of standard features include a high mounted third brake light, front fog lamps, rear defogger with timer, centrally located fuel tank and so on. It has seat belts for all occupants along with driver seat belt warning notification on instrument panel. Its rigid body structure has side impact bars along with crumple zones for protecting occupants inside the cabin in case of any collision. It has side impact bars on all the four doors and crumple zones, which absorbs the impact during accidents to minimize the injuries. It also has an engine immobilizer that helps to prevent an engine to start if a proper key is not used. In addition to these, it also has central locking system along with child safety rear door locks, motorized head lamps adjustment, door open warning and headlamps on key out warning. 1. Attractive exteriors with a few modified features. 2. Improved mileage and better power is a big plus point. 1. Diesel engine noise and harshness can be reduced.